Enjoy 24 hour private jet charters from Los Angeles to San Francisco with Los Angeles Private Jets, the #1 source for private jets in Los Angeles and surrounding areas of Southern California. Chartering a private plane from LA to San Francisco is the fastest, most comfortable way to travel between California’s largest metropolises. Passengers can depart using Van Nuys Airport (VNY), the preferred private airport for Hollywood celebrities & VIP travelers, and arrive via private terminals at airports across the Bay Area, including Oakland, San Francisco, San Jose, Palo Alto, Napa Valley, and more. We also arrange return flights from the Bay Area to Los Angeles, with access to private planes based across Northern California, including transient planes returning to LA we can use for an empty leg flight and save you thousands on jet charter costs. From on-demand aircraft rentals and last minute charters, to multi-leg flights and exclusive one-way pricing, we negotiate with operators in California and across the country to offer the most competitive rates on private jet charters without sacrificing the safety, comfort, or quality of your flight. Our safety and service standards are some the highest in private aviation, and we enjoy access to thousands of charter planes near you to find the best deal on your private flight to San Francisco, CA. Call us at 888-987-JETS for instant ballpark pricing and all-inclusive quotes on private jet charters from Los Angeles, CA to San Francisco, CA. The cost to charter a private jet from LA to San Francisco for a one-way flight starts at under $5,000 in a piston; around $7,500 in a turboprop, $9,500 in a light jet, and $11,000 in a midsize. Same day round-trips will be similar to one-way pricing; otherwise they can range between $10,000 to $30,000, with larger planes equating to higher hourly rates. Check out some of the example costs to rent a private jet from LA to popular destinations across the Bay Area including Napa Valley, Silicon Valley, and San Francisco/Oakland. Looking for the most cost efficient way to charter a flight from LA to Napa Valley? Rent a Beechcraft King Air 200, a longer version of the King Air 100. Known as one of the most most popular turboprops in the world, the King Air 200 offers high speed performance, seating for up to 7 passengers, and an attractive hourly rate. It’s a outstanding option for regional flights, especially for the Pacific coast flight to Napa County Airport (APC) in Napa, CA, or for executive flights to Palo Alto Airport (PAO) in Silicon Valley. Need to rent a business jet to Silicon Valley? The Phenom 300 offers high performance and exceptional range, and while it’s considered a light jet, it really stands in it’s own class. It offers cabin dimensions, performance, range, and charter costs that compete with popular midsize jets; it’s BMW designed interior seats up to 8 passengers and no light jet offers more baggage space than the Phenom 300. No wonder it’s the world’s best selling business jet since 2013, and an ideal choice when renting a private jet from Los Angeles to San Jose. The Gulfstream G4 (GIV) is an icon of luxury aviation, and chartering one can be as much of a status symbol as a means of transportation. If you’re traveling with a group of up to 16 passengers and want to make the trip to SF in style, the G4 is one of the most comfortable, luxurious ways you can fly. The Gulfstream GIV can also be an ideal upgrade from the super midsize category if you need to bring more luggage, relocate with pets, or splurge on a luxury jet to the Bay Area, whether you choose to arrive at OAK, SFO, or SJC. * Hourly rates only depict the aircraft rental cost and does not include fuel, taxes, and operational fees. ** Example pricing is all-inclusive plus tax and based on previous flights and average market pricing. Additional fees including de-icing, catering, additional flight time due to weather/ATC, Wi-Fi usage, and ground transportation billed separately. Rates and availability subject to change based on scheduling, positioning, fuel costs, and other factors. 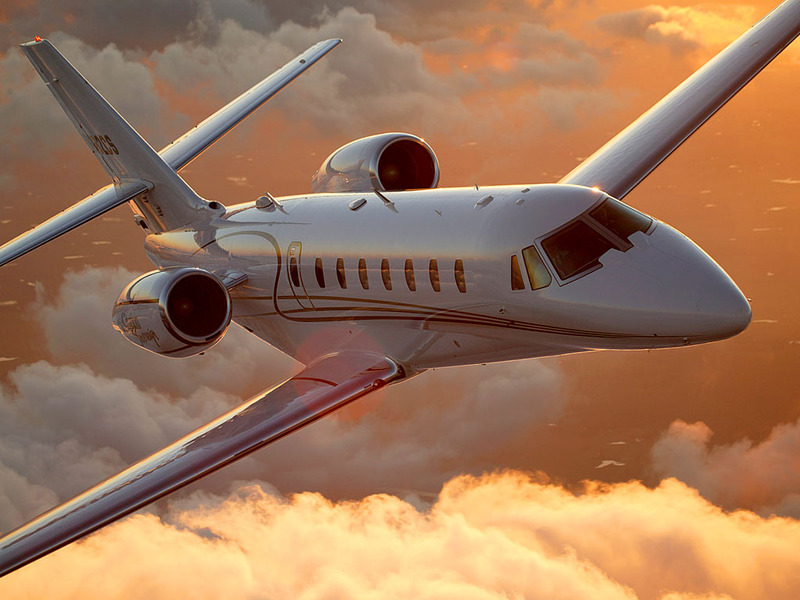 Request a free charter quote for the exact cost of your flight. 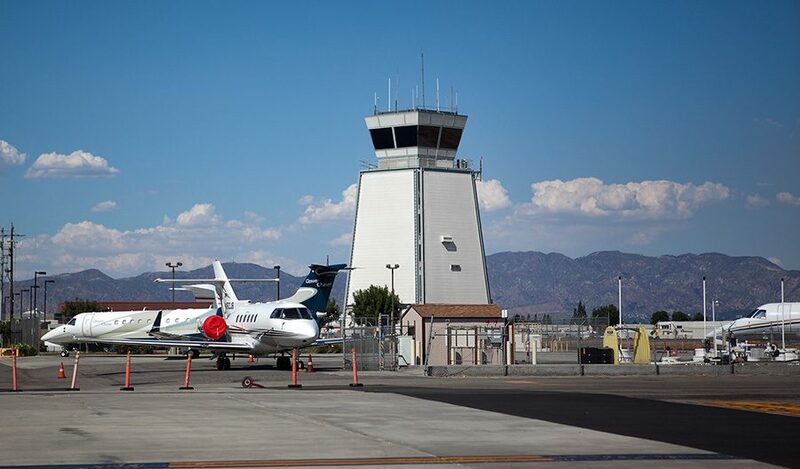 Our jet charter company offers access to private planes on-demand with around the clock air charter services at Van Nuys Airport (VNY), the world’s busiest private airport. We also arrange 24/7 jet charters at Bob Hope, Santa Ana, Long Beach, and airports across the LA area near you so you can avoid Southern California’s freeways and get the most out of your trip. For your arrival, you can choose from over a dozen airport in the Bay Area, including smaller airfields focused on general and private aviation that help avoid congestion at major commercial hubs and land you closer to your destination. Most clients flying private to the Bay Area arrive via Oakland International (KOAK), which offers a more convenient arrival and lower charter costs. Southern California is one of the busiest regions in the world for private jet travel. There are more than 2 dozen airports scattered across the area with hundreds of planes based locally, allowing you to depart from closer to your home or office. Although Van Nuys is the preferred option, we can arrange for your flight to depart out of any of the following airports in the LA area. No matter which side of the Bay Area you’re traveling to, we can arrange your plane to arrive at the closest available airport, saving you time and avoiding the hassles at major commercial airports. Most passengers choose to arrive at Oakland International (OAK), although flights can be arranged to San Francisco International (SFO) or any of the following private jet airports in the Bay Area. Our team specializes in arranging private jets in the Los Angeles and Bay Area charter markets, with tools and relationships that let us find the best deals on private flights between Los Angeles, CA and San Francisco, CA. We offer flexible options so you can choose the right aircraft for your needs, from individual travel in twin-engine pistons and turboprops, to luxury flights in mid, super mid, and long range jets tailored for a VIP experience. Popular aircraft rentals for flights between LA and SF include turboprops (King Air 90, Cessna Grand Caravan, Cirrus SR-22); midsize and super midsize jets (Citation XLS, Hawker 800XP, Learjet 55, Gulfstream G200); and wide-cabin, long range jets (Challenger 604, Gulfstream G4, G5, G6; Global 5000/6000/XRS; Falcon 7x). 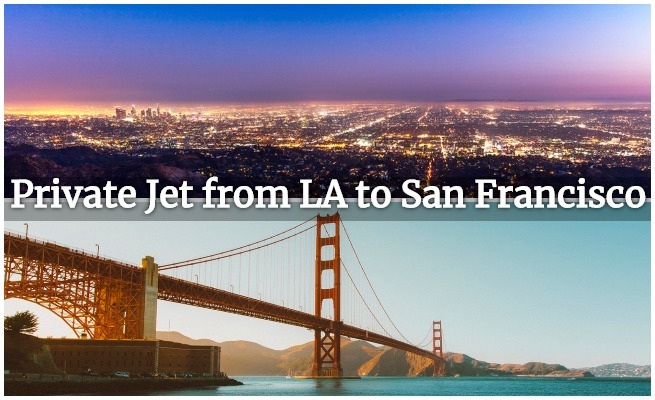 Do you currently have a jet card membership and frequently use it to travel between LA and SF? Request a FREE quote and compare us to your jet card — it might be cost-effective to save your hours and charter on-demand. Don’t have a jet card? We offer 25, 50, and 100 hour jet cards on light jets, midsize jets, and heavy jets for travelers who fly more than 20 hours annually. Give us a call to discuss your aircraft options, including empty legs in Southern California. Even if we can’t find a transient plane for your flight, we still offer the most competitive charter rates in luxury and business aviation. For instant pricing & availability on private jet charters from Los Angeles, CA to San Francisco, CA, or to receive FREE charter quote with no strings attached, give us a call at +1-888-987-5387 (JETS). Our brokers are available 24/7 to accommodate all of your jet charter needs, including ASAP flights and last minute jet charters in LA.